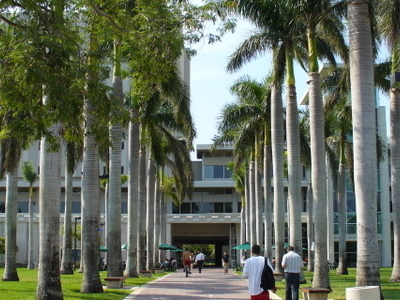 The University of Miami informally referred to as UM, U of M, U Miami, Miami, or The U is a private, non-sectarian university founded in 1925 with its main campus in Coral Gables, Florida, a medical campus in Miami city proper at Civic Center, and an oceanographic research facility on Virginia Key. As of 2009, the university currently enrolls 15,629 students in 12 separate colleges, including a medical school, law school, and a school focused on the study of oceanography and atmospheric sciences. These colleges offer approximately 115 undergraduate, 114 master’s, 51 doctoral, and two professional areas of study. Over the years, the University's students have represented all 50 states and close to 150 foreign countries. With more than 13,000 full and part-time faculty and staff, UM is the sixth largest employer in Miami-Dade County. Here's the our members favorite photos of "Universities in Miami". Upload your photo of University of Miami!